It takes extraordinary effort and courage to uplift a person from the depths of anonymity, accept them as they are and assist them to preserve and progress beyond what is expected of them. 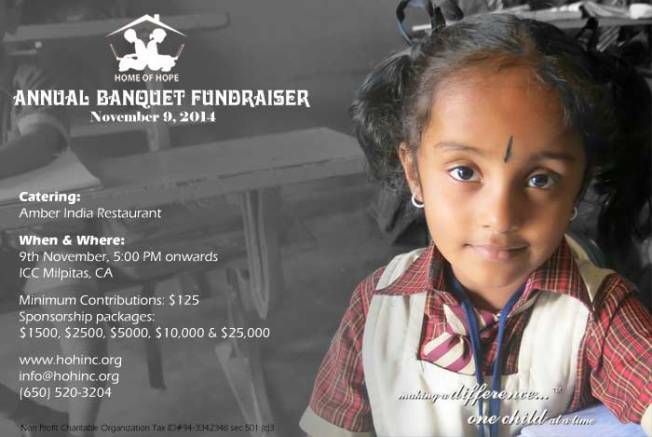 You can help in this effort at the Annual Banquet Fundraiser on November 9 in Milpitas. Sponsor a table or attend the banquet to help Home of Hope reach their $50,000 goal. Someone once said " in hopelessness there is always hope." At Home of Hope, they believe and strive to enable and give the disadvantage and disabled a life of dignity and self reliance.